4/22/19: GOOD NEWS! THE STORE IS OPEN!!! (as of today, Monday April 22nd, noon-ish Eastern Time) Get your hands on Book 19!!! Plus, I do have a tiny supply of most of the Sluggy Freelance Books. Also Megatome 02 is SOLD OUT but a new version is coming sometime in the summer. Details at the Store! I'm shooting for comics Monday Wednesday and Friday of this week but so far Monday is the only one done. [+] Halloween in November? Christmas in January?!? So I wanted to put up the Halloween main page in time for Halloween this year. But, dang it, the characters were in such peril at that time that switching the main page from "Oppressive A.I." to "Pumpkin King" seemed a little too off-tone. But I like it so I'm running the Halloween decorations from November 4th to November 10th. And Defenders, check out my Pumpkins this year! "So that's Halloween in November. What's Christmas in January?" Well that has to do with Book 19, "BROKEN". I finished everything except for the bonus content, and that's tricky because of the nature of the story, dark and relentless once it gets going. I feel a need to add some bonus content but am stuck on the concept stage. From a practical point of view, I think it's doubtful that I'll be able to get Book 19 to the printer, have it turned around in 30 days, send the Defenders20+ the books I owe them, open the store, and sell copies to you all that would arrive before Christmas. But I think and hope the book will release sometime in December and reach you all in January. I have not yet figured out how this will effect when the Sluggy Store will reopen. 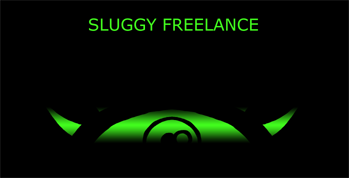 It's really taken me over a year to get the hang of this new way of doing Sluggy Freelance. I'd keep getting epiphanys on how to embrace the new freedoms, but still kept finding new ways to trap myself. Twenty years of constant midnight deadlines are apparently hard to shrug off! In previous years, missing a holiday release would put a ton of stress and guilt on my shoulders. I am SO thankful that I don't have to feel that anymore, even if it's taken over a year for my brain to realize it. It's OK if I miss a holiday deadline. I'm still going for books 20, 21, and 22 in 2019! And Book 19, "BROKEN" will be not too late, and everything will be fine. And I can be less stressed, and focus on some personal aspects of my life that demand my attention, such as the health of loved ones. I think I might just get it, at last! [+] THE PAWNZ YOU NEED!!! The Pawnz and Bookmark for September is centered around Ghost Val from this comic! I wanted something Haloween-ish leading into October! Sorry for the lateness of the September Pawnz/Bookmark Announcement. If you've been paying attention to my overlong "TL;DR" headlines you probably know how much work and personal issues I've been drowning under. But here's where I play catch up, and get to show you something I think is really cool! 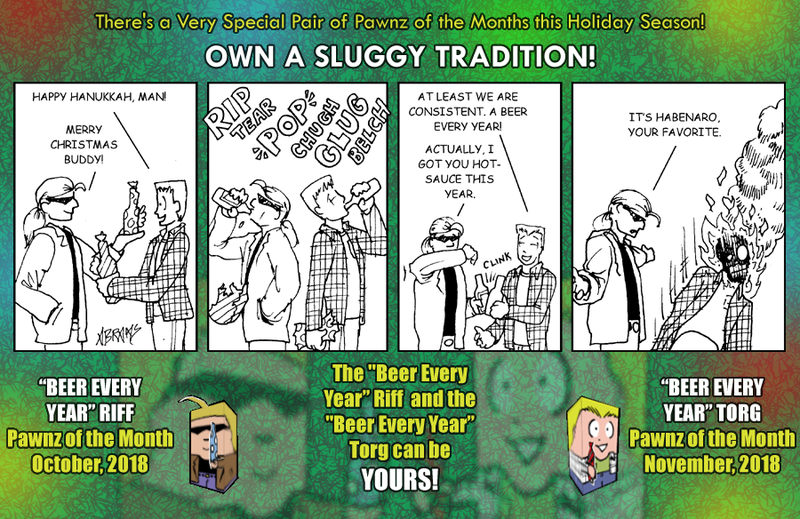 The upcoming Pawnz of the Month for October and November: "The Beer Every Year Riff" and the "Beer Every Year Torg!" 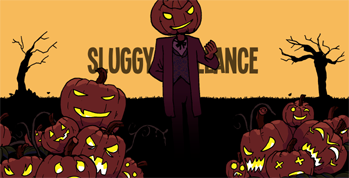 Its a Sluggy tradition that can be yours in PAWNZ FORM! THIS IS SUPER NIFTY!!!! Just be a Defender 20+ Level 2 "Faithful Ferret" (or any higher level) by October 12th, and stay at that level until December 1st and you will receive both Pawnz in your digital collection! Be a Defender 20+ Level 3 "Super Sulggite" (or any higher level) by October 12th, and stay at that level until December 1st and you will ALSO get physical postcard versions for you to cut up and assemble and put under the tree or by the candles or wherever would bring you joy! I'll send them to you for free wherever you live! One of the reasons I chose October and November for these guys was so I could mail them out to you early December so you could have them in your hands in time, postal carriers willing! 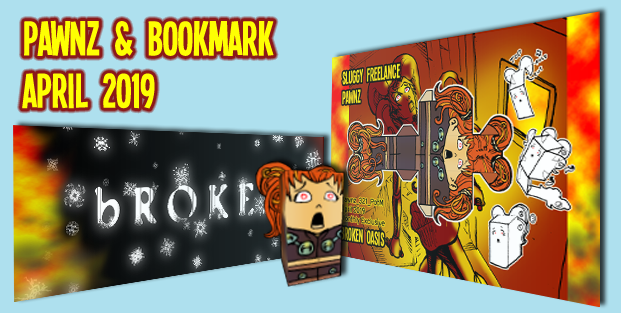 And don't forget the bookmarks! 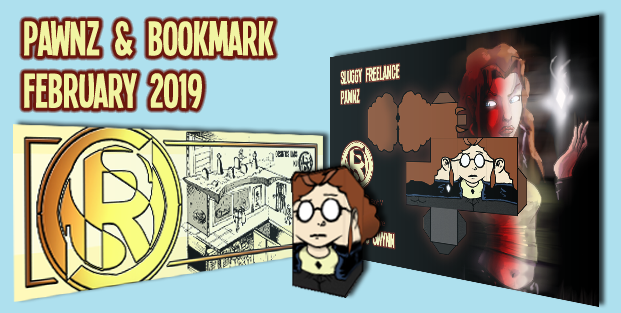 If you're eligible for the digital pawnz you'll also get these two digital bookmarks to note your favorite strips in the archive! 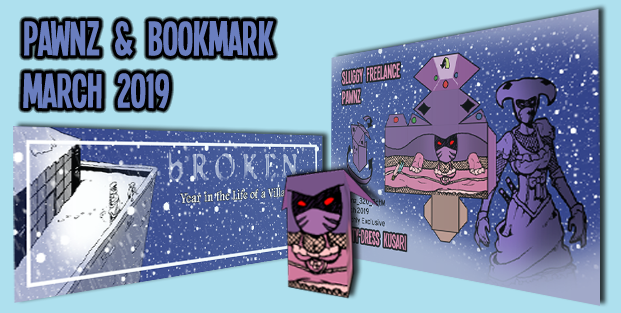 One is the perfect bookmark for your favorite Sluggy Freelance Holiday Memory! The other, inspired by Joe Sunday's alternate beer label, is perfect for a strip too hot to handle! If you're eligible for the postcard version you'll also receive these as actual bookmarks to put in actual books! As always thank you guys so much for your support. 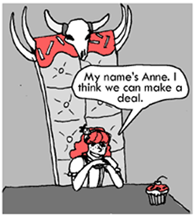 I didn't think I'd still be doing Sluggy Freelance as a webcomic past the 20th anniversary. You saved Sluggy Freelance, Defender20+! You! Thanks! 8/17/18: THERE WILL BE SIX COMICS IN A ROW FROM AUGUST 20TH-25TH!!! (and I'm planning the next comic would be the 28th.) Why on earth would I overload my comics-creation schedule when I'm behind on mailings and orders and want to do a book release and auctions and am feeling overwhelmed? 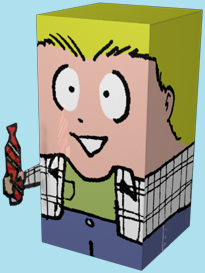 I had a scripting breakthrough! And I needed to know where the animated anniversary strip would land. And I need to get through that many strips to make my target. This may (probably will) mean delays in the Book 18 release and all other things, but I'm going to push myself old-school style and focus on the comics. This is the right choice despite delays it might cause. We're Old School Sluggy Stylin' Baby!!!! Hey everybody! Sorry for the obnoxiously large headline, I'll move this to the news section soon. Many things to cover! THANKS TO LEAH FOR FILLING IN FOR ME! We just spent a week in Orlando checking out the Wizarding World of Harry Potter. Pretty damn cool! And Potterverse is coming up this weekend! How much Butterbeer can one man take? LOGIN ERRORS: We ran into a certificate update error of some kind from sometime Sunday (8/12) to around 4PM Eastern Time Monday (8/13) in which the site lost some functionality and nobody could log in. That's been fixed and everything should be A-OK now! I HAVE A BOOK 18 IN MY HANDS! It's gorgeous! A bunch are still on the way. As soon as I have them all, the first thing I'll do is get them out the door to the Defenders20+ I owe them to. Then I'll put them out in the store, and then have them available from IndyPlanet. All this by August 25th? I'm going to try! IMPORTANT DEFENDERS20+ NOTE ON BOOKS:the higher tier Defenders20+ get, at Level 4, every new book mailed to them for free. At Level 5 that book is signed. And at Level 6 (Chaz) they get a custom doodle in their book (I'll email personal requests to you unbelievable Chazzers soon)! It is important to note that you must maintain that level of support for at least 3 months to be eligible. 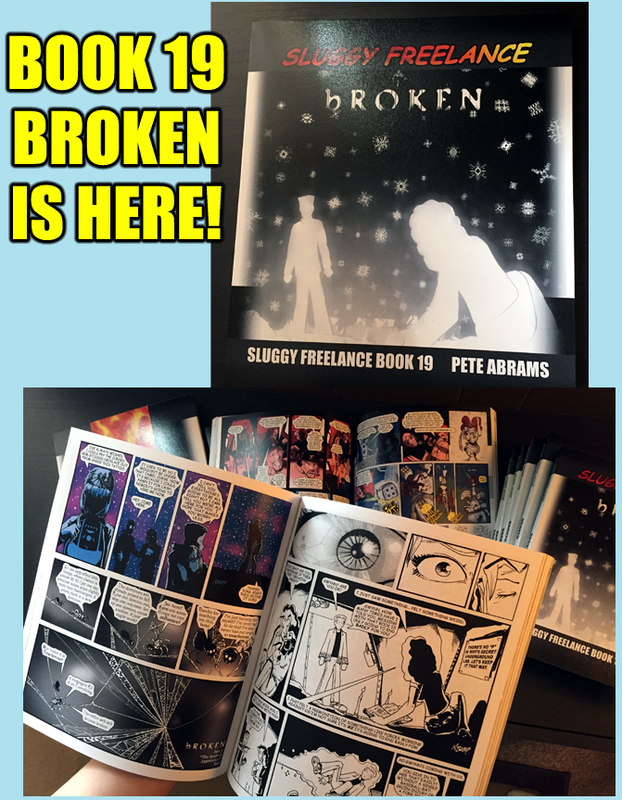 Since the next book, BROKEN, is coming out in November, if you want it sent free or signed, or doodled in, the time to start that level 4, 5, or 6 Defenders Membership is now, (by August 17th) just to be safe! Details on Defenders20+ levels here. THE STORE WILL REOPEN SOON! Because I'll be adding book 18 and adding a few of the other books into the store I've shut down the store for about a week and a half. That will help give me needed breathing room, at least a little. WAY BEHIND ON MAIL REWARD PAWNZ AND BOOKMARKS! But I'm hoping to get caught up by the end of next week! I'M ABUSING MY CAPS-LOCK! But trying not to abuse my brain. Between the Pawnz-mailings, outstanding store orders, Defenders20+ book shipments, an animated strip on the 25th, and running an original art auction that I'm months behind on running, I'm looking to be pretty overwhelmed. I'm going to do my best to manage things but there may be less strips this month because of that. Apologies ahead of time but I will get all the things done! My dad's taking the week off from everything (which is why I get to fill in!). It's his birthday on August 4th and I'd know he'd love for you to celebrate that, and Sluggy Freelance going on for over twenty years (that's crazy!!! ), by becoming a Defender20+ if you can. He's really helped me to foster my love for art and comics all my life and I couldn't be more grateful. Thanks for putting up with me these two weeks! Thanks for letting my dad take a full week off. Happy birthday dad! I moved this from headlines to news! POTTERVERSE IS COMING UP AUGUST 17TH! 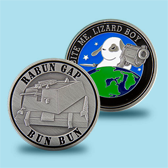 Check out the NIFTY Rabun Gap Challenge Coin that Baen just put out! STORE ORDERS: ALL ORDERS HAVE BEEN SENT OUT! Thanks for your patience! 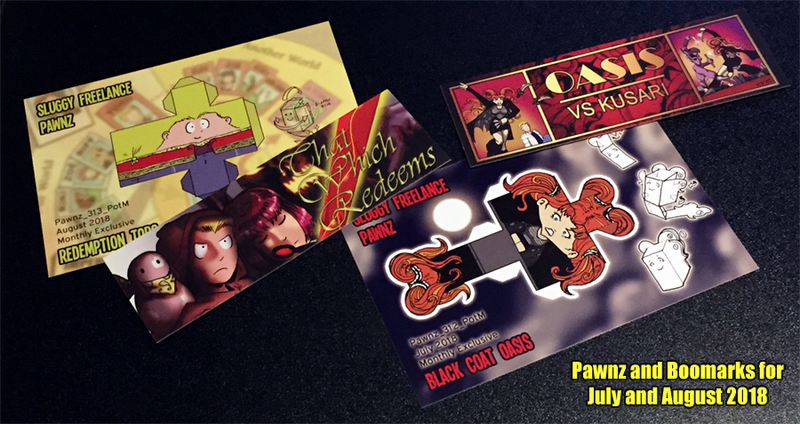 PAWNZ & BOOKMARKS MAILINGS: Falling a little further behind on these! They are almost ready to go out but because of scheduling may have to wait one more week. The BotM PotM for August is a That Which Redeems' Bookmark and REDEMPTION TORG! First: A minor note on mailed Pawnz and Bookmark rewards! Because of logistics, we've decided to send out what's owed every two months instead of monthly. It in no way changes what you've earned and what you will receive! It just makes things MUCH easier at mail-time! Next: A Note on Leah's Comic! You remember when Leah started doing some Guest Artists comics for me? It was supposed to culminate in a 10-comic (two week) extravaganza finale. She finished the art a looooong time ago. And she finished the colors almost 6 months ago. But with the new system we needed to make sure we could run 'guest artist content' that Defenders20+ would, by default, NOT be billed for. The system is now in place so I'm thinking of running the two weeks of Leah artwork somewhere in mid-late July to early August depending on where certain comics fall. These 'Leah Comics' will not change the amount of comics I intent to do in a month, they are additional bonus joy for you all! What if you did want some pledge-money to potentially go to Leah? You have options! Go to "https://login.sluggy.com/manage_subscription" to see them. 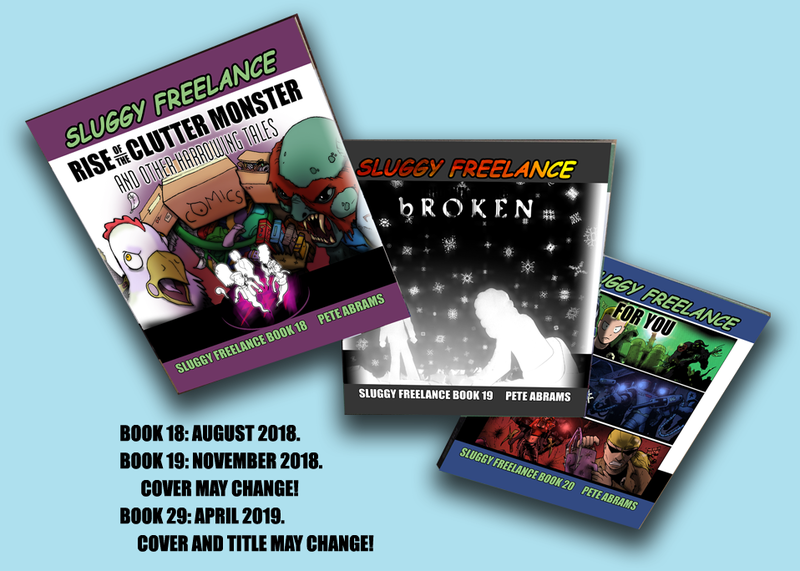 Changing the type of content you pledge for:If you check the (unchecked by default) box "I also pledge this amount to Filler and Guest strips" then you'll be pledging for Sluggy Freelance strips, guest strips (like Leah's), and filler art. But you'll still only be billed for the first 12 strips in a given month by default (for example, if I ran, like, 4 Sluggy strips, 6 Leah strips, and 8 more Sluggy strips, you'd be billed for 12 strips only). Changing how much of that do you pay for:If you also uncheck the box (checked by default) "Bill me for a maximum of 12 pledges a month." you'll be billed each time content of that type comes up. (for example, if you also pledged for Guest Strips, if I ran, like, 4 Sluggy strips, 6 Leah strips, and 8 more Sluggy strips, you'd be billed for all 18 strips). Currently there are only a handful of Defenders20+ who have done this and that's all OK by me. I love you all! I just wanted to arm you with confusion-free info. You D20+ already rock as you are! Finally: THE NOW AND FUTURE BOOKS! Sadly I can't run the 'Mission Accomplished' banner because the book is not off to press yet. But it's damn close! I'll have the book ready to sell (and send to D20+'ers levels 4 and up!) by the Sluggy anniversary, which is nice timing. I had really wanted to accomplish three books this year, and I mean three THICK books, as catching up on the books is one of my dreams that the new system is meant to assist with! But I've had issues wrapping my brain around and achieving balance with the new system. 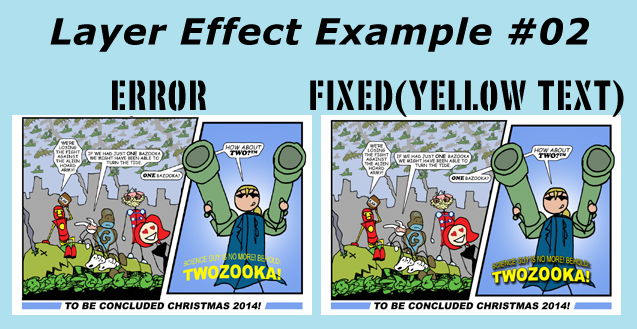 For the longest time I was more concerned about comic output than book output. No more to that. I will cut back on comics as necessary (as I already have) and get those HUGE books done from here on out. Book 18 is around 200 pages! The next book, Book 19, which will be ready in time for the holidays, will be "BROKEN." This centers on a very important book in the series as you know. I'm going to want to handle it right. I'm starting work on it even as Book 18 wraps. Working ahead! Hey! That's new thing for me! ;) Also look for three big books in 2019, four if I can manage. To finally NOT be a decade behind on books, that is going to feel amazing! 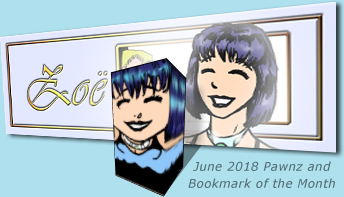 Head's Up: the Pawnz and Bookmark (of the month) for June is 'That Dress' Zoë! FINALLY! The idea that there were still comics in the archives with errors or glitches has been haunting me for a while and I finally finished my Archive-Run-Through! YAY! Now that doesn't mean that there aren't still errors in there, but if you spot anything now you can let me know and I'll fix it up directly. 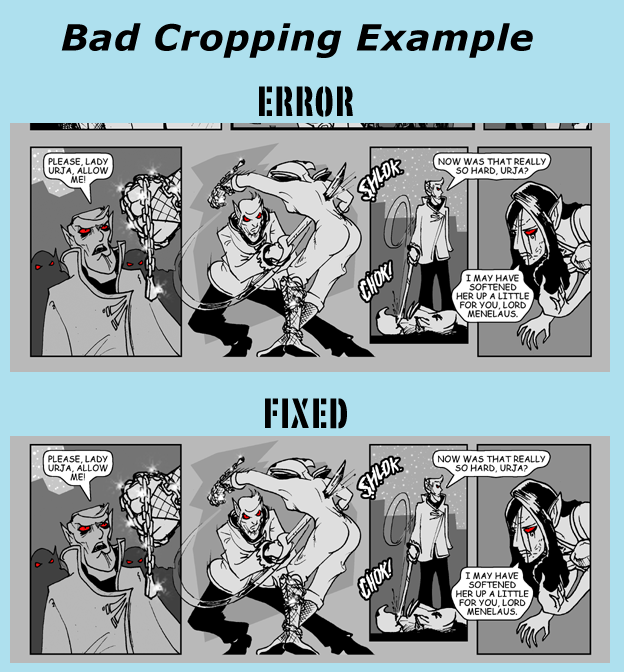 The errors at this point seemed to be restricted to bad cropping (where part of the panels from the next or previous strip show up cropped), or a Photoshop Layer Effect removal which would remove some text outlines or shadows. YOUR HELP IS VERY WELCOME! It felt good to balance getting the archives done with keeping up with the story. I'm going to try it again for June this time focusing on THE NEXT SLUGGY BOOK(S)! Here's hoping for another "Mission Accomplished" announcement early July! [+] Back on the Clock! Hey Everyone! Quick note. I'm back on top of the comics! Now I need to play catch-up on emails, store orders, pawnz-mailings, and tackling the archives and the next book. It's a big pile for me to tackle but I'm ready to go! My mother died last week. There's part of me that wants to tell you about my mother. There’s part of me that wants to dismiss the whole thing, as I am, at heart, an introvert who wants to be left alone to grieve and who understands most of us will go through this sooner or later. The third part, the most demanding yet most unnecessary part (solely because of my messed up brain), is to let you know that this is the reason for me falling behind. There will be less than 12 strips this month. Any other comics that arrive in April are only because I had scripts ready, and the art-part is a welcome distraction sometimes. I’ve also decided there will be less than 12 strips in May. I’ve been determined to finish repairing the archives and get the next book ready to print, and actually had a bit of a lead on strips. But then we got that call and we rushed to be by her side. 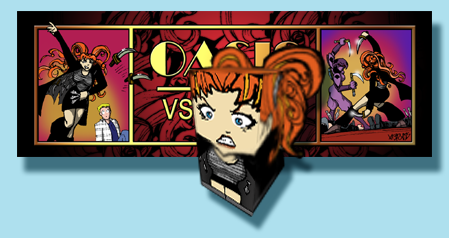 Now I’m even more determined to get that done even if it means falling further behind on strips. I’ll keep you all posted as best I can. As private as I am, I do want to share a thing about my mom. She filled my childhood with science fiction and fantasy and creativity. She’s the reason I grew into the storyteller I am today, and that creativity carries through to her grandchildren. Thanks mom. We love you and we’ll miss you as fiercely as you loved us. I spent just about all day yesterday and today scripting. So long I started getting a headache today and had to stop. It's not like I have writers block. I just have... let's call it "character overwhelment". There are so many players in this story with their own goals and agendas and relationships with the other characters in play. Giving each one full attention and following each one around linear events would make the story meander forever. I don't want that. I won't have that. I actually had a script ready to go for Monday and the next few strips tightly scripted too, but it was one line in the strip that made me pause. 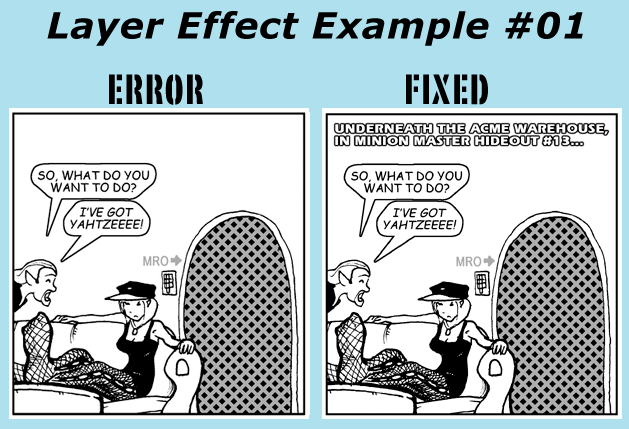 I realized that one line fixed a character in a particular point and time that would require a bunch more strips to tell. But if I was clever I could tell that part of the story a better way. And for that I'd need to pin down where everybody was and would be, not just the 'major players' in what's occurring (and the major players may not be the ones you are currently thinking of). It took all yesterday and today (Today being Tuesday 4/10/18) but I got it 90% done and ordered. Then I looked at the clock. 8pm. I still needed a tight script. One that would not screw up the 10% that still needed hammering out. I knew... KNEW... I had already failed in my mission of getting a strip up by Wednesday. Even if I hacked something together it wouldn't make it in the queue until after midnight and with the new system there ARE no late strips. A Strip after midnight is just NEXT midnight's strip. I feel terrible. Like I've made a huge mistake by not posting SOMEthing. And a bigger mistake by not taking the time to get this next bit right. I know for a fact that one thing I was looking forward to about the new system was to NOT have that midnight guilt-deadline on my back every night. It's been liberating shaking that daily midnight stress off. It's chilling to find it back. Despite how I feel I've chosen my path. To write this "right." 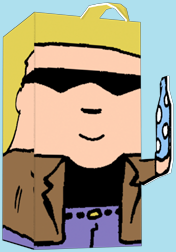 The next comic you see here, which may be tomorrow, maybe the next day, it won't blow you away with amazement. BUT the comics that follow should paint the clear and building story it needs to be. Thanks for having more patience with me than I have with myself. And thanks specifically to you Defenders 20+ for giving me the chance to write better and relax more. I'll get the hang of living outside the cage sooner or later!